Scott Carver is a lecturer in wildlife ecology in the School of Biological Sciences at the University of Tasmania. He specialises in the ecology and epidemiology of infectious diseases, spanning wildlife, domestic animal and human health. He is interested the transmission, pathology and emergence of infectious diseases, and pursues these interests using a combination of field studies, experiments and mathematical modelling. This, often involves collaborating with investigators in other disciplines, such as geneticists, immunologists, mathematicians and veterinarians. 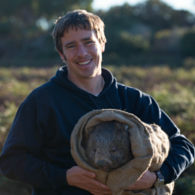 His research focusses on some key systems, including: sarcoptic mange in wombats, pathogen transmission in puma and bobcats, Ross River virus, and chlamydial infections of koala and agricultural animals. Underpinning his research interests is a multi-disciplinary background. The combination of training in molecular and ecological biosciences, and a keen interest in mathematics and statistics has supported diverse collaborations across multiple countries. Scott completed a degree in physiology and a Masters in ecophysiology at Victoria University of Wellington, in New Zealand (1998-2004), and a PhD on the ecology of Ross River virus at the University of Western Australia in Perth (2005-2008). He then undertook four years of postdoctoral studies in the United States. He spent two years at Montana Tech of the University of Montana (2008-2010) studying a small mammal associated hantavirus (Sin Nombre virus) that can spillover to humans and cause mortality. Following this, he spent two years at Colorado State University (2010-2012) studying pathogen exposure and cross-species transmission among puma, bobcats and domestic cats around the urban-wildland interface. Scott joined the School of Biological Sciences in 2012. He continues his research into disease transmission in puma, bobcats and domestic cats in North America, focussing on Feline Immunodeficiency Virus (an analogue for HIV in humans). He has reengaged in mosquito-borne disease ecology in Australia, picking up where his PhD finished, with specific emphasis to understand the complex ecology and epidemiology of Ross River virus, particularly the role of marsupial hosts in human epidemic patterns. He has also established new research directions. A major focus of his lab is studying sarcoptic mange, which is the most threatening disease of wombats in Australia, and infects >100 species of mammal globally. He collaborates and co-supervises students studying Tasmanian Devil Facial Tumour Disease. He also works closely with colleagues studying the epidemiology Chlamydial infections among agricultural animals and koala, and vaccine development. Scott has authored 50 peer-reviewed publications and book chapters, as of July 2015. Since arriving at UTAS he has successfully attracted grants exceeding $2.5M. Funding sources include the Australian Research Council (Linkage program), US National Science Foundation (Ecology and Evolution of Infectious Disease program), Holsworth Wildlife Foundation, the Government of Western Australia (Funding initiative for Mosquito Management) and internal UTAS funding sources. Scott's research combines the University's research themes of: Better Health; Environment, Resources and Sustainability; and Data, Knowledge and Decisions. His research interests include wildlife conservation, health, and understanding how parasites are transmitted in natural and anthropogenic settings. Scott's research is primarily focussed in Australia and North America, but has a significant global focus. This includes research into emerging infectious diseases in wildlife worldwide. While focussed on infectious diseases, Scott's lab also undertakes research with a more pure ecological focus. This includes anthopogenic impacts on individual species and communities, such as land-use impacts on platypus and aquatic invertebrate communities. His research is not focussed on any particular animal taxon (spanning aquatic invertebrates to large terrestrial carnivores), but rather focusses on critical problems and questions which relate to disease transmission and anthropogenic impacts on the environment. Since 2011 Scott has been an assistant editor in Journal of Wildlife Diseases. This funding will address the problem of being able to feasibly treat wombats in the field at the population scale. The funding will support the development and testing of a potentially long-lasting treatment for wombat mange. The goal is to develop a single-dose treatment for mange in wombats, eliminating the need for multiple treatments in difficult field conditions. Despite range-wide declines, the bare-nosed wombat remains relatively understudied, with key gaps in our knowledge that are critical for the species conservation. For example, little is known about the genetic diversity and connectivity of populations across the bare-nosed wombats range. Fundamental understanding of the movement among populations and the genetic distinctiveness of mainland Australian, Tasmanian, and Bass Strait island wombats is also lacking; these have been previously suggested to represent subspecies. It is critical to identify genetically unique, and likely diverged, wombat populations that warrant separate conservation recognition. Our research goals are three-fold: 1. To quantify genetic diversity, population structure, and gene flow, revealing wombat movement patterns and genetically distinct wombat populations. 2. To define the phylogenetic relationships among wombat populations from mainland Australia, Tasmania, Flinders Island, and Maria Island. 3. To reveal historical demographic changes and identify populations that are at-risk (i.e. populations that lack genetic diversity, have experienced a bottleneck, etc.). A one year field and laboratory study to further our work on the evolution of resistance and tolerance in Tasmanian devils to facial tumor disease and to advance knowledge of immunology of devils for vaccine research. This work is a collaboration between the School of Biological Sciences and the Menzies Institute for Medical Research. Chlamydial infections in sheep can result in significant on-farm losses for Australian producers. These same infections threaten the security of our billion dollar live export industry. Surveillance of chlamydial infections is hindered by out-dated serological tools that are unreliable and difficult to interpret. Utilising significant advances in pathogen genomic data, this project aims to develop new and effective species-specific serological tests to detect the most important chlamydial sheep pathogens. It is anticipated that the new information and tools generated will improve domestic surveillance, the key to reducing on-farm losses, and also reduce costs and create new marketopportunities for Australian sheep exporters. The project will support control efforts of treatments of wombats for parasitic mange and enable adequate monitoring of population health. This project will involve training and engaging a local team of volunteers to assist with monitoring the recovery of the wombat population at Narawntapu National Park. Funding will be provided to engage school students for educational purposes and to raise awareness of the plight of the wombats. It aims to establish long-term, cost-effective monitoring system for local biodiversity at Narawntapu N.P, and to build knowledge in the North West Tasmanian community of local biodiversity values and threats to these. Tasmanian devils persist in areas long affected by facial tumour disease. We will reveal how epidemic anddemographic patterns are changing, and how devil's social and spatial organisation, breeding and dispersal maintainpopulations in the landscape. The project will help predict the epidemic outcome and the future of the devil. This project aims to produce an optimised, safe, field-tested, protective Chlamydia vaccine for koalas. In many regions of Australia, Chlamydia infection severely reduces female koala reproductive rates, threatening the species long term survival. This project builds on work developing a prototype vaccine for koala Chlamydia, and intends to produce a vaccine ready for potential registration and use by koala care centres, wildlife hospitals and government departments. Philanthropic donations to study the wombat genome and undertake research guided management of sarcoptic manage in a wombat population. Answer key questions about the impacts of sarcoptic mange on the common wombat by investigating key immune genes, phylogenetic history of the mite and understand the influence of secondary infections. This project will reveal the mechanisms underlying continued persistence of low density wild devil populations in areas where population and stochastic modelling have predicted a genuine risk of local extinction. The project aims to establish the biochemistry blood indicator baseline in wild devils and assess how it changes at different stages of infection. This project will take advantage of an existing database describing land use characteristics, water quality and other environmental variables spanning streams from Natural Resource Management areas across South Australia. The dataset is under the banner of the Australian River Assessment System (AUSRIVAS) comprising over 900 stream sites periodically sampled since 1997, with the South Australian Environmental Protection Authority as the lead agency for the program and the Australian Water Quality Centre (South Australian Corporation) as a third party partner. Models of a-diversity will be explored using taxonomic and trait-based approaches in response to land-use and other environmental variables. To achieve this, regression models will be used to evaluate the hypothesized drivers (e.g. salinity, stream flow, nutrient condition, land-use type) of community structure. Information theoretic approaches will then be used to compare multiple models or hypothesis. The project will then compare and contrast how the best models of taxonomic indices compare to best models of trait-based indices. Structural equation models will be used to model direct and indirect determinants of macroinvertebrates. Coefficients associated with these direct and indirect pathways and their significance will be obtained and how much of the variation in the macroinvertebrate communities will be explained by the direct and indirect environmental determinants. This project will model Ross River virus in Western Australia to apply to improved management. It aims to integrate mechanistic modelling with mosquito-borne disease control management. Scott currently advises/supervises/co-supervises seven PhD, two Masters, two Honours and one undergrad research student. He also employs (part time) two postdoctoral researchers. He has previously mentored one postdoc, two Masters, four Honours and 16 undergraduate research students.